I've never considered myself overly tech savvy. However, I do enjoy looking at any new bright and shiny object, just like most other 21st century males. 95% of them I'll never learn how to use, but just like women they're always nice to look at. I also can be quite forgetful, which is why I took to a simple little idea that pretty much every browser that I use employs, the bookmark. I have so many different pages that I like to go and look at from time to time, it's a pain to try and remember all those domain names. I also enjoy trading with my fellow bloggers and blog readers that I have to bookmark their blogs and want lists so I can quickly look up their lists to see what they're looking for. Case in point: While going over my bookmarks last week, I came across one that I hadn't viewed in quite a long time. Blog reader Greg A. (whose comments show up as GCA everywhere) has a pretty detailed want list that I had a few cards for. So I sent him a quick email, and lo and behold, the spoils arrived today. 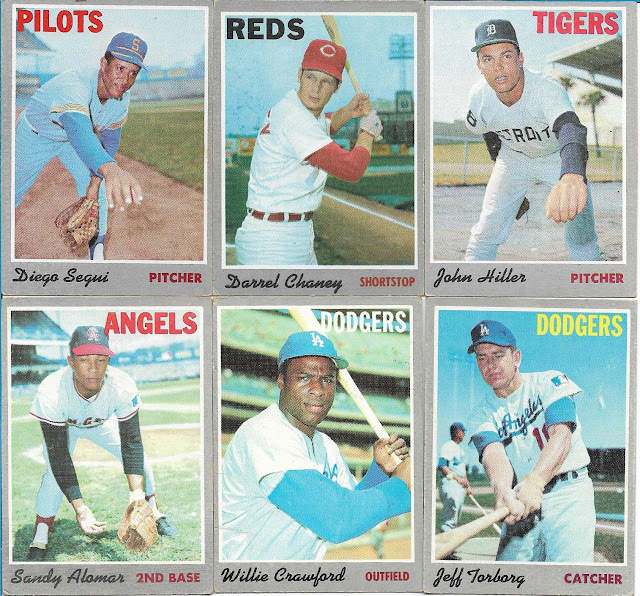 The 1970 Topps set was one that I started putting together because I was able to get a nice starter set from my previous vintage dealer in PA on the cheap. After that, I maybe bought 25 or 30 more cards, then promptly set it aside while working on other pursuits. My recent devotion to getting more want lists on my blog led to Greg sending me 15 cards from the '70T want list. They were all low numbers from the 1st series, but that didn't matter. 15 cards off of a vintage want list is fine and dandy for me!! Check out the wad in Jack McKeon's cheek!! Greg also sent me some cards from the '74 Topps want list, a set that in terms of starting and chasing is very similar to the '70 set. Bought a nice lot, added a few cards to it and set it aside. Added the want list to the blog recently and voila!! 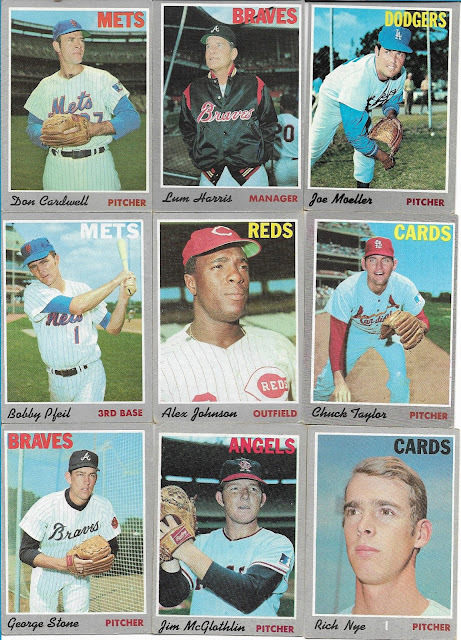 10 more off the want list (the KC Royals team card didn't make the scans today). I believe this is the 3rd trade I've completed with Greg, and as memory recalls each one was very quick and easy. Thank you very much Greg for the trade, the cards are really appreciated. I'll try not to go so long next time between trades. Lots of managers in that 74 lot. Wonder why KC only had three coaches? Maybe they blew the coaching budget on Jack McKeon's chew? Ha! The Redman budget was through the roof. Glad you liked them Robert! 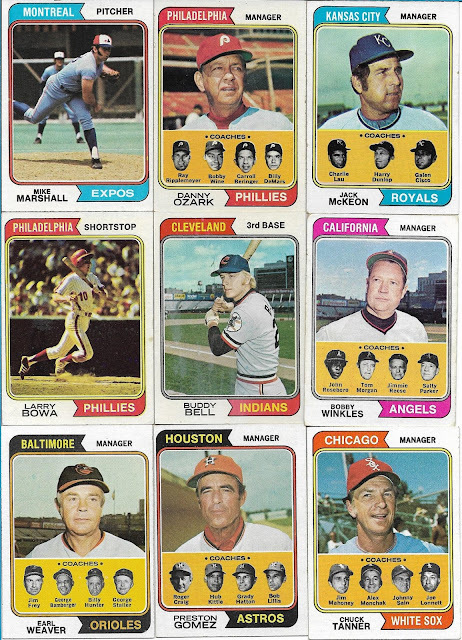 Yeah, my one batch of '74s is mostly managers and team cards. And anyone building a mid-grade (or worse) '70, '71, or '72 set, drop me a line.